We had learnt in school that, Men used to live in Caves, but we never thought we will ever go back in history, and live those Cave-Man days, that too in Style & Luxury. 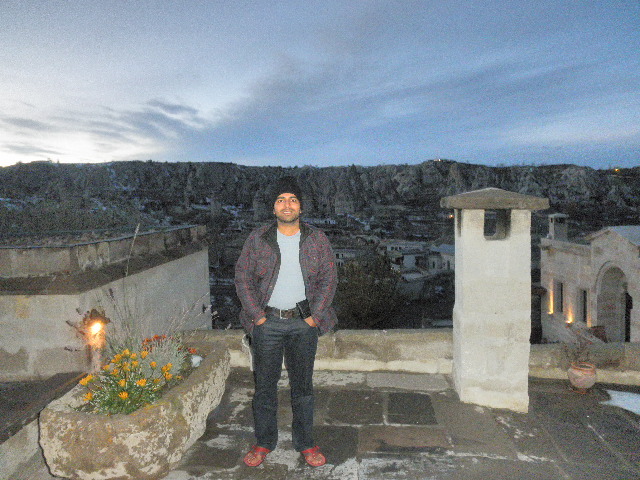 Cappadocia was covered with snow when we walked in the Hotel Kelebek at 6 a.m. in early December last year. 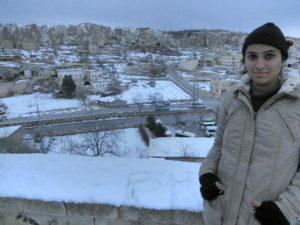 The Snow covered Chimneys of Goreme, as it is called on Map, were really a sight, which got etched deep in our memories. It was our honeymoon, so we had booked a Suite for us called Winter Residence (Room 104) for three nights. We booked this place through directly contacting the hotel through email. The booking procedure involved sharing of credit card details for one night charges (in case of cancellation). Overall, the booking procedure was safe and fast. When we arrived at early Morning in the hotel, the ever helpful Staff of Kelebek Hotel allowed us to check-in our Suite at 6 a.m. (instead of 12 a.m.). 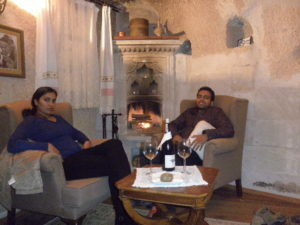 Thereafter, they lit fire in the fireplace in the front room of our Suite and did a literally warm welcome to us. They even provided us compliemtary Breakfast (what was not included for the first day).In one word, our first impression of this Hotel was Awesome!! This was indeed one of those Hotels, who strive to provide their customers a home away from home. 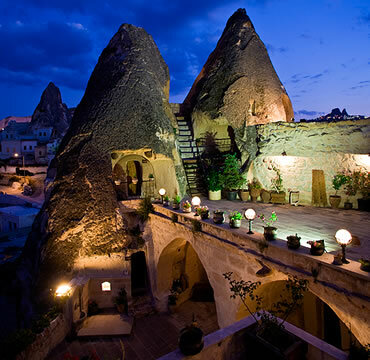 The hotel is rightly placed in the Goreme towm. The view from the hotel are lovely in all angles. We spent our first day entirely at the Hotel relaxing and enjoying the serenity around. The cave rooms were warm from inside and had good heating arrangements. While we were there, it was snowing outside and still, it was warm inside. In our opinion, you simple cannot have any complaints about heating arrangements. 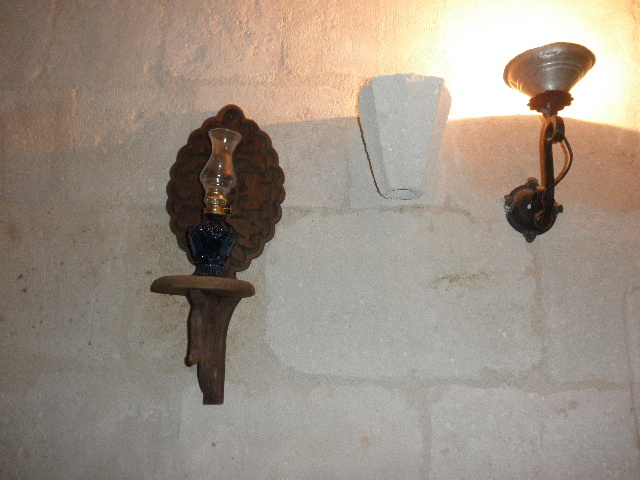 The interior decoration of the room was very classy and rich. 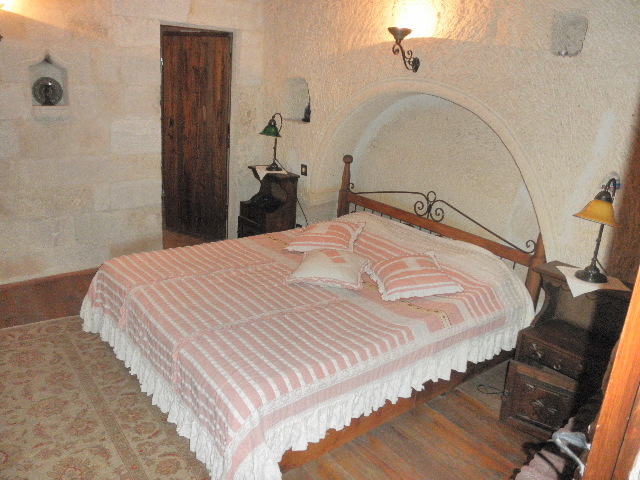 Our room (room 104) was a cave room with a stone facade. Also, the room had a comfotable Super King size bed. The front room of the Suite had a fancy fireplace, which will surely take you to a vintage Romantic Era. As, we were on our Honeymoon, the staff provided us complimentary bottle of wine and bucket of exotic fruits, thereby enhancing the romantic mood set by fireplace and cave. The suite had spacious bathroom with good interiors, Jacuzzi and stylish fittings. 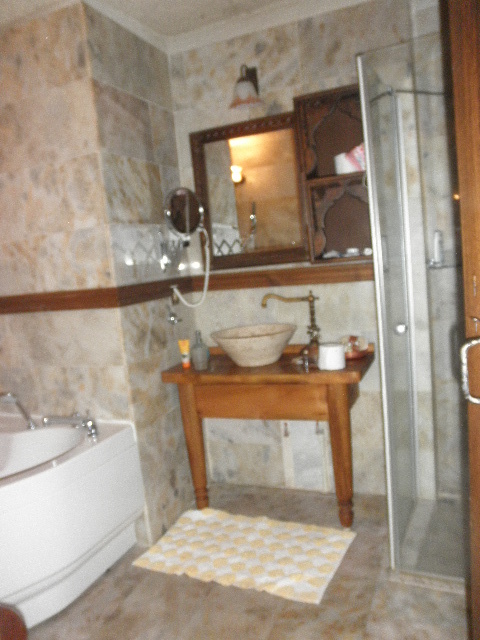 We really enjoyed the Couple Turkish hammam at the hotel. 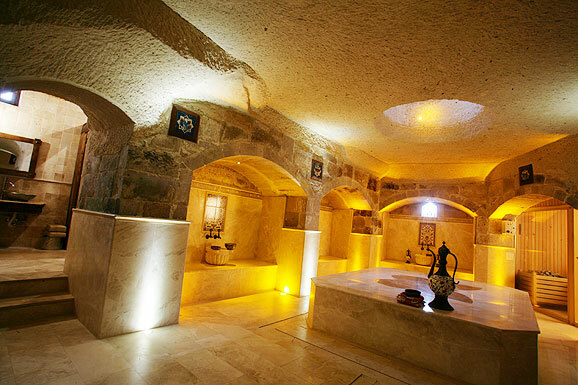 The Hamam and Massage was a luxurious and relaxing indulge. In our view, it is one of the things which is recommended and not to be missed. A lot of healthy and delicious options were available at the Breakfast, which was included with stay. The cooks were really helpful that they made delicious Indian Masala Omlette for us everyday (I gave them the recipe !!). The ambiance of the restaurant is lovely. Also, they have open air dining option available (with cute cats around). In your free time, you may sip the free Turkish tea at the Hotel all day along. We met interesting travellers over there and made few friends too. 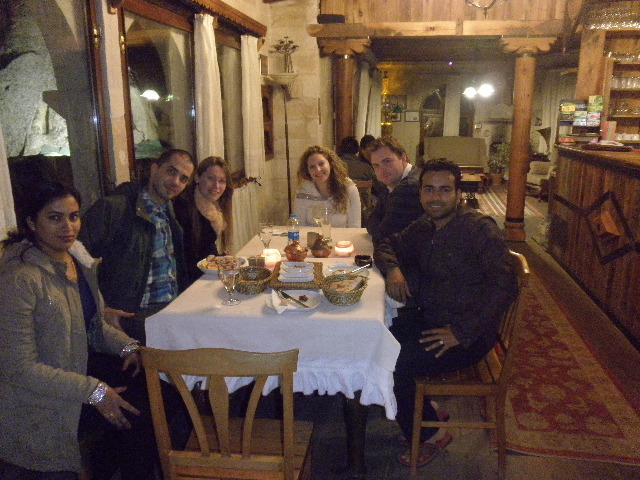 We are grateful to them for organising Butterfly Hot Air Balloon Tour and Cappadocia Undiscovered Tour for us. We found these tours exclusive and rightly priced. They offered us a both cash discounts and winter discounts on the room price quoted on website. The Reception as well as Restaurant Staff were really courteous and helpful people. On each day of our stay after breakfast, Mr. Mustafa, the manager used to tell us over tea, about how should We go about the entire day, where should We visit. He recommended us nice local hotels fro Dinner. This is one of those hotels which offered a lovely, memorable, luxurious and ever cherished honeymoon stay to us. We would love to go back to this place always. You may visit the website of Kelebek Special Cave Hotel for reservations and other details. Note: TravelJots does not have any affiliation with Kelebek Special Cave Hotel. It is just a honest review, to bring the best to our readers. I’m kind of jealous you got to visit Cappadocia while there was snow there!! (was it insanely cold??) I went last fall/late summer – and it was definitely the highlight of my Turkey trip. So magical! The chimneys looked great covered in snow. It was not insanely cold for us, it was 2 or 3 degree Celsius. The cave rooms had good heating. Also, there was great Turkish tea to keep us warm.